The ski run down off the mountain - Four O'clock Run - ends right in front of entrance to the River Mountain Lodge condos for sale. Walk through the lobby and out the other side - there's the Blue River and Main Street on the opposite bank. River Mountain Lodge condos offer a hotel-style accommodation separated into individual condos - some as small as 400 sq. foot studios to others as large as 2,000 sq. foot four-bedroom apartments. One of the most unique Mexican restaurants in Breckenridge is on the garden-level, along with a modern fitness room. Above this, is an outdoor, heated pool. Conference rooms and a comfortable bar and lounge are on the first floor. And below, underground parking for all guests. 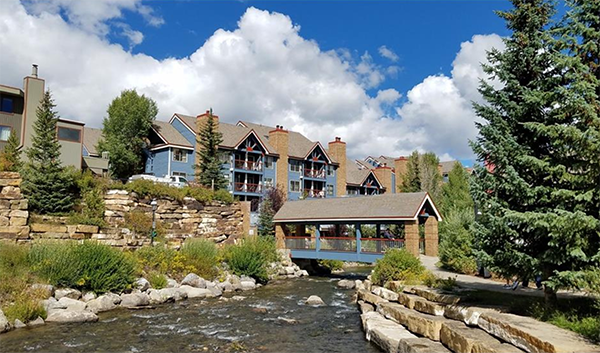 Find out more about the amenities offered in this popular complex, or start your search for a River Mountain Lodge condominium below. River Mountain Lodge condos are as in-town as it gets. Its neighbors to the south are the Blazing Saddles Center with ski shop and liquor store, and the Riverwalk Performing Arts Center. A pedestrian bridge over the river connects River Mountain Lodge, from its river side, to the most central block of downtown Breck. River Mountain Lodge condos are the most central accommodations offered in town, and getting to the lifts is as simple as a free-town bus ride, or a walk of two or three blocks ñ south to the Quicksilver or north to the gondola. There is a 24-hour bell service and check-in desk, and these condos generate short-term rental income for their owners. Potential property for sale in River Mountain Lodge will also include four commercial condos. Across the road is the start of a walking trail to Shock Hill and the Cucumber Gulch Wildlife Reserve. Size (Sq. Ft. Liv. Area): 137 sq. ft. to 1963 sq. ft.
River Mountain Lodge is located on the southeast corner of Ski Hill Road and Park Avenue. From the traffic circle on the north side of Breckenridge, take Park Avenue (the continuation of Highway 9) through one stoplight, and continue for.5 mile. River Mountain Lodge will be on the eastside, as soon as you pass through the traffic light on Ski Hill Road. 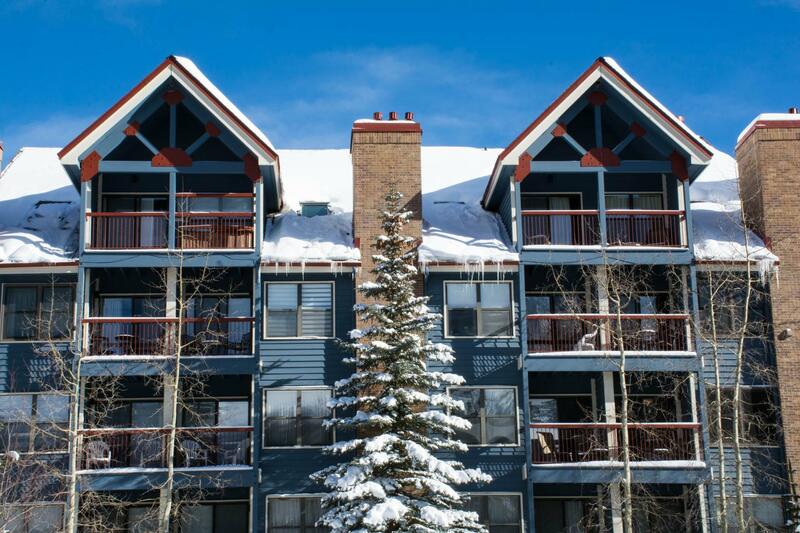 Need more information about River Mountain Lodge, or any other condo complex in Breckenridge, CO? Contact an expert at Breckenridge Associates now!